This summer my oldest son, my first baby, had his 6th birthday. This was going to be our first kid party that didn't just involve friends' and family's kids. I wanted it to be a birthday to remember, and because he likes Star Wars, I thought I would do a Star Wars party. 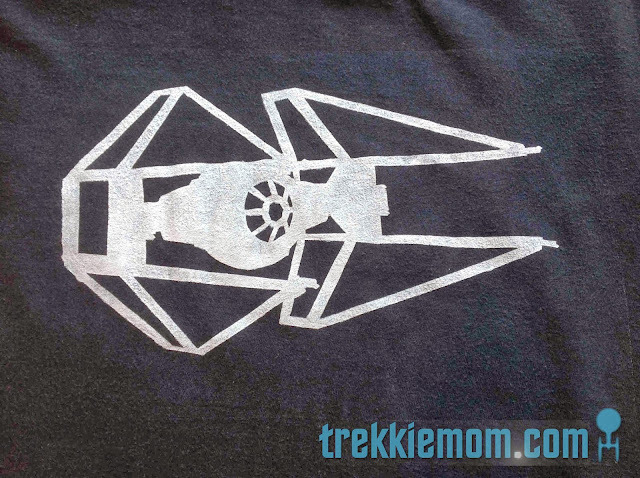 I had a ton of great ideas to make this the most fantastical Star Wars B-day Party EVER! Now I suspect that I am not the only Mama who wants to make their first child's first birthday party perfect. But most of my ideas were just not feasible as a working mother. They probably aren't even feasible for a stay at home mother (I am not stupid. I know you don't sit at home eating chocolate and watching Jerry Springer. You work hard too. ), but it didn't stop me from trying. Ha, ha! One of these great ideas was to provide non-candy related, hand-made party favors. 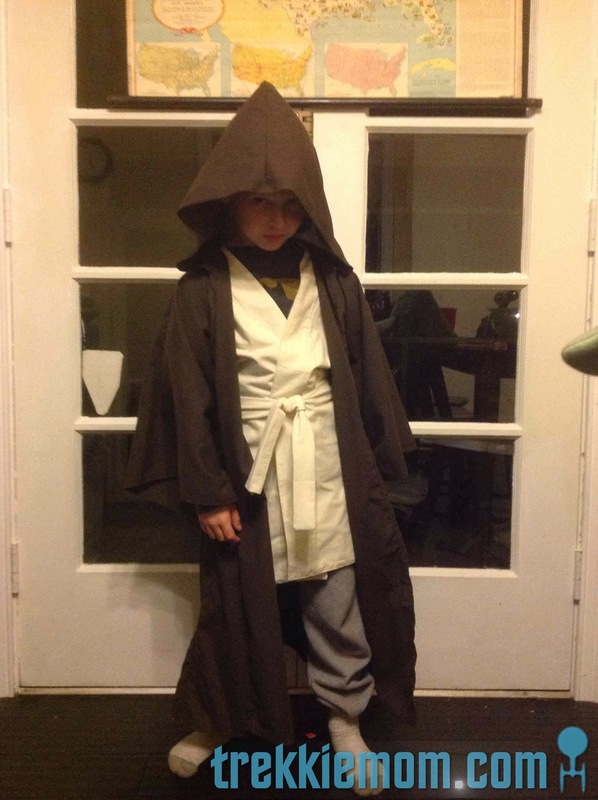 At first I wanted to make all the kids Jedi robes based on this tutorial, but after the prototype took an entire weekend, I decided that just was not gonna happen. Here's my prototype. It finally saw some action on Halloween. Then I thought that I could do Jedi vests because that was less material and easier to sew. AND after 3 prototypes because the first was too small, the second too big, and the third just right, I figured out that I just didn't have time for that either. The Jedi vest is a Kelley Special, i.e. no pattern, not based on anything, just an idea out of my own head. The just right version found its way out of the closet for Halloween with the robe. 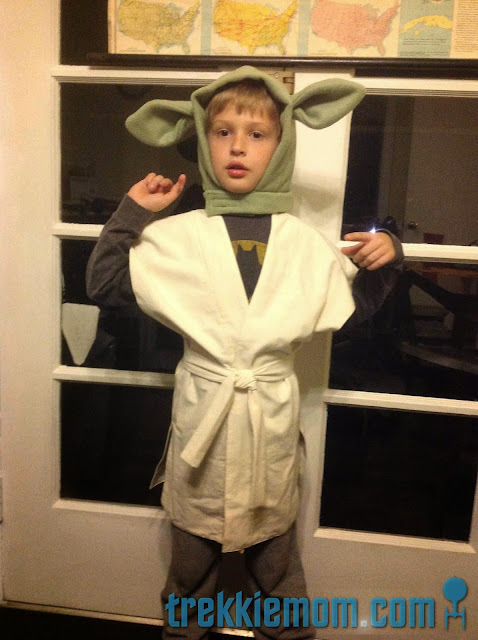 If the head piece doesn't give it away, my son wanted to be Yoda. Soooooo, my next idea was making t-shirts with fabric paint, and time was getting short. I geared up my exacto knife skills (phew, got the hang of that pretty quick), sought out 2 plain t-shirts from the bottom of my son's drawers that he didn't wear because they did not have anything cool on them, and got to work. Here are my tester T's, which are now cool enough to wear. 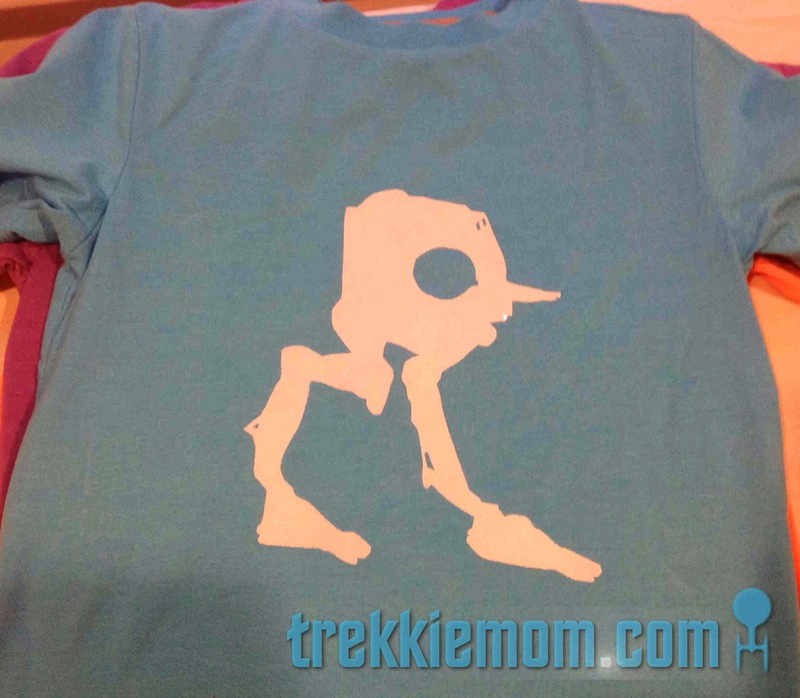 If you didn't know, these are Imperial Walkers. 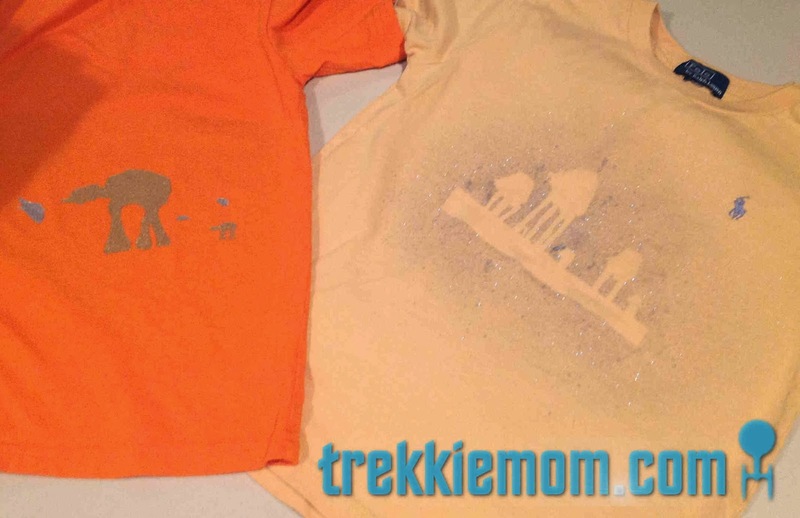 On the left, my son chose the colors and helped me paint that shirt. For the yellow Ralph Lauren shirt on the right, I tested out the spray fabric paint. Don't cringe. Both shirts are hand-me-downs and on their 3rd kid, so for me they were free. Not bad, if I do say so. Anyway, I was very happy with the results, and I knew I could finish enough for the party. 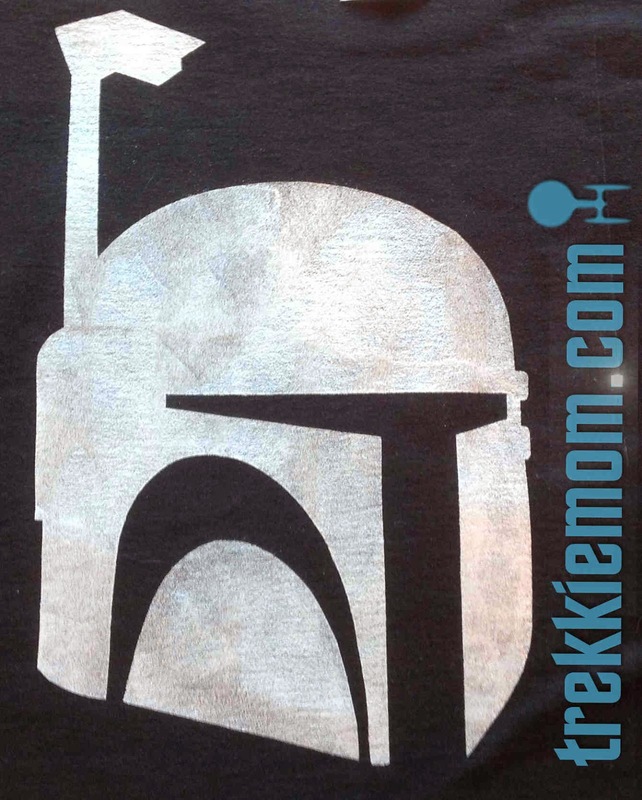 To create my stencils, I searched the Internet for Star Wars images that appealed to me, and that I thought would be easy to cut out and still be recognizable when painted one color. I resized the images in Word (I know, I know, there are way better products out there) so that they would fit the shirt in a way that I liked. I even cut and pasted parts of images to put them together in a way that I found appealing, which you can see with the Death Star and Darth Vader below. I would put 2 pieces of freezer paper under each image on top of my cutting mat and go to town. With this method I was able to get 4 possible stencils, 2 'positive' and 2 'negative' images. That probably is not the right terminology, but it is how I think of it in my mind. Again, below the Death Star and Darth Vader images are good examples. I have a 'positive' and a 'negative' of the same stencil. 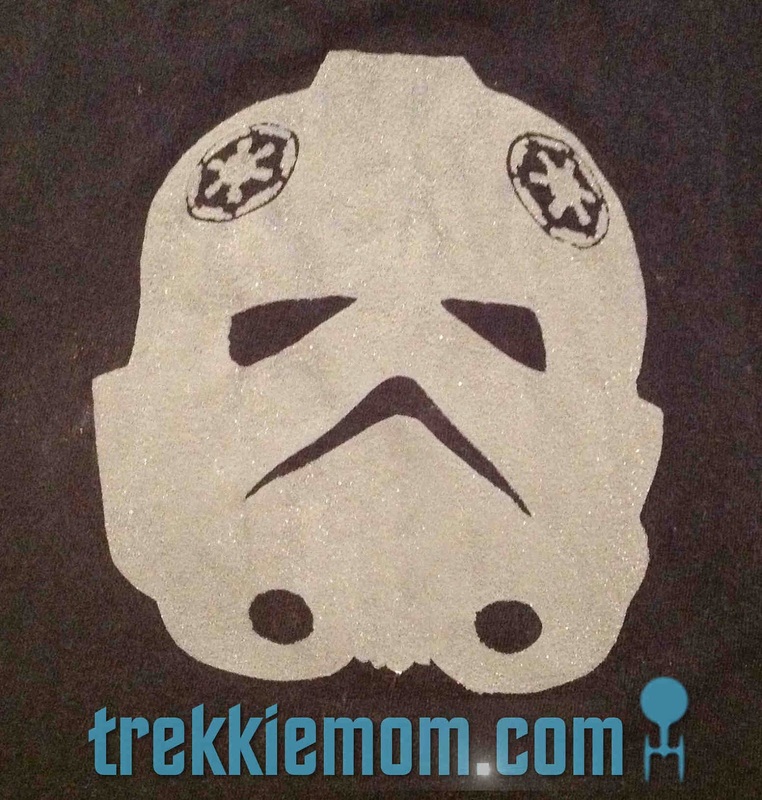 By getting 4 stencils out of one cutting session, I was able to produce enough stencils for the party favor t-shirts. I used my lunch hour at work to cut 2-3 different images, which equals 8-12 stencils in one lunch hour. Here is just a sample of the shirts that I made for the party. This is one of my favorites! The All Terrain Scout Transport turned out great. I made this one for my 2-year-old. It's another favorite. 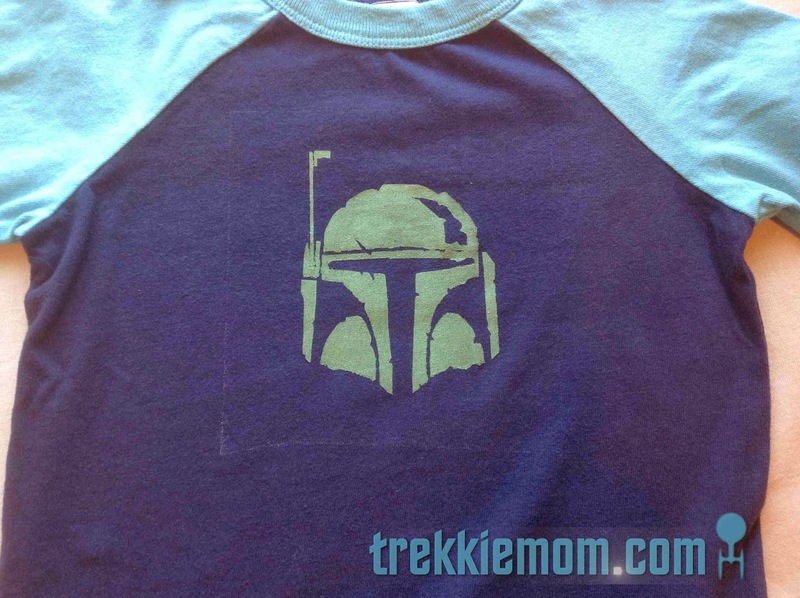 Boba Fett's beaten up helmet looks good even with a stencil bleed. The night before the party, my husband announces that he thinks he should have a Star Wars shirt too, don't you think? I had made my own, but that is because I am a scifi fan, and it is just fun. Here is what I came up with for him with a day left to go. Back - Now that is some exacto knife precision! 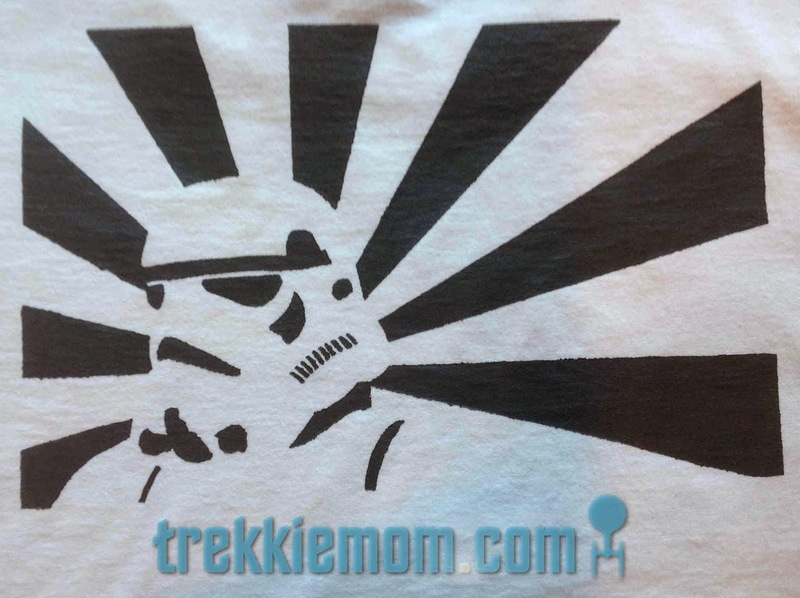 These t-shirts were so successful, that I ended up painting Star Wars images for my son's sleep towel and art shirt for kindergarten. 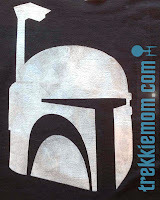 I referred to IAmMommaHearMeRoar.net's tutorial about freezer paper stenciling to get started. Don't be afraid! You can do it. 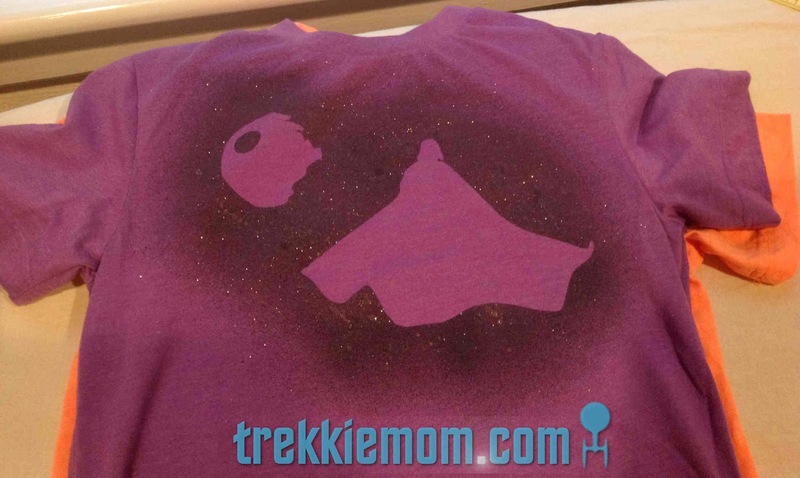 Now, I just need a Star Trek shirt for Mama.